There are number of political parties in Pakistan but the top 8 parties are Pakistan Tehreek-e-Insaf (Imran Khan), Pakistan Awami Tehreek (Allam Tahir Ul Qadri), Jamaat-e-Islami Pakistan, Pakistan People’s Party (Bilawal Bhutto Zardari, but he is being replaced by his father Asif Ali Zardari against the will of Late Benazir Bhutto), Pakistan Muslim League – N (Nawaz Sharif), Jamiat-e-Ulema-e-Islam, Awami National Party (Sheikh Rashid Ahmed), Muttahida Qaumi Movement (Altaf Hussain). Many of the leaders in Pakistan have been assassinated that include, Liaqat Ali, Benazir Bhutto, Fatima Jinnah and many more. Four martial laws in Pakistan have been imposed and one of the amazing facts is that all four times it was day of Tuesday. Two times when Martial law was imposed at that time PM of Pakistan was Nawaz Sharif, it is considered that every time he comes in power all the setup is disturbed massively causing martial law to be imposed. In 2014 too it was thought that martial law will be imposed but the current instability of Pakistan doesn’t allow Pak army to take this step as they are occupied with Zarb-e-Azb operation against the terrorists and terrorism. People’s party and Muslim league- N has come in power in Pakistan twice and thrice respectively. In the era of Nawaz Sharif the development of roads, motorways, metro bus project and distribution of laptops among students took place. Imran Khan is the cricketer turned politician who has the heart that goes out to his people; he married to Reham Khan recently. He is a great leader who led cricket team in 1992 to win first world cup and now wishes to empower youngsters. 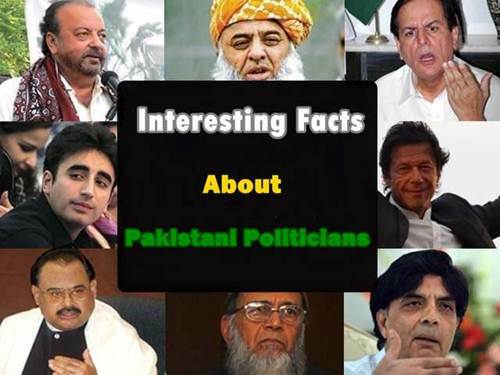 These were just some of the facts about the politicians of Pakistan. There are many hidden realities about each and every politician. It is also necessary that all the politicians assets are made known to people and brought back to court as this is one of the biggest debates in the present time.